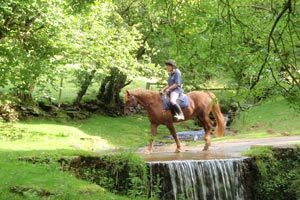 Hacking on the Trails in the Black Mountains..
Hacking is suitable only for experienced riders, capable of cantering in open and varying terrain. Numbers are limited for these rides, and we have plenty of exhilarating canters on well-schooled forward going and sure footed horses. As we ride on mountain terrain, we do not gallop everywhere as there are areas we ride upon that are only suitable for walking and trotting. 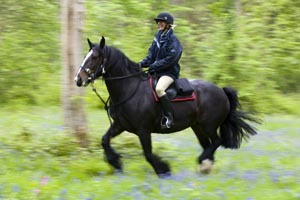 However, when on suitable canter tracks we do enjoy the wind in our hair. You will be accompanied by our experienced and qualified staff, who will guide you around some of the many trails on the Black Mountains. After introducing ourselves, the day starts with registration and the fitting of an approved riding hat, for those that require one. 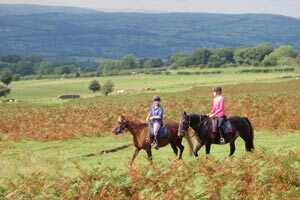 We then give a safety talk and a riding demo, before heading out on the hills. We advise you to call us and speak about your experience, height and weight at the time of booking, to help us match you to a suitable horse for you. We have a recommended weight limit of 14 stone for hacking.